Who said big button cordless phones can't be stylish? The Gigaset E370A proves that you really can have it all. With a sleek, modern design and a host of handy features for elderly users, this model certainly has a lot going for it. But how well does it perform in practise? We put the handset to the test in our latest review- read on to find out how we got on. Eagle-eyed readers may have spotted that the Gigaset E370A looks a little familiar. That's because the basic design is modelled on the C570A, Gigaset's flagship cordless phone. The most obvious difference is that this model is white, while the C570A is black. The buttons on the E370A are also slightly larger, and they also light up to make them easier to see. Other than that, though, the fundamental design remains the same. Not that this is a bad thing, though. Like it's older sibling, the E370A is every bit the premium handset. Built to an extremely high standard, it looks and feels far superior to the average cordless phone handset. With a minimalist style and large, full-colour display, everything is beautifully streamlined. You can even increase the font size to make things easier to read, and the numbers when dialling are automatically larger than normal. It's also nice and easy to grip, too, as it fits neatly in the hand. Finally, it's also worth mentioning the phone base, which doubles up as a standalone answer machine. Just like the handset, this base is also an attractive piece of tech. Base stations are usually rather dull, and most people tuck theirs away out of sight. Not so with this one, though- it looks refreshingly modern, and you can also listen to your messages on it, too! The Gigaset E370A is essentially plug-and-play, so it's very easy to set up. Just plug the base unit in to the power and your phone line, pop the rechargeable batteries in the handset, and you're ready to go. If you've got multiple handsets, then you'll need to register these as well, but this is as simple as following an on-screen guide on each handset. Even the more advanced features, like SOS calling, are simple to set up. Gigaset's menus are clear and self-explanatory, so users should have no problem working their way through these. If you're already used to Gigaset phones, then you should find the menus reassuringly familiar. As with all Gigaset cordless phones, the E370A provides top-notch sound quality. For a phone aimed at older users whose hearing may not be what it used to be, this is especially important. We were seriously impressed by the sound quality on speaker mode, too. With other models, speaker mode can make the audio start to break up- but not so with the E370A. There's also an extra-loud mode that doubles the handset's volume while you're on a call. Even then, the sound quality stays crystal-clear, so users should have no trouble hearing what's being said at the other end of the line. To help even further, there's the choice of two different acoustic profiles. Higher frequencies are harder to hear as you get older, so setting the profile to "low" can really help improve the call quality. 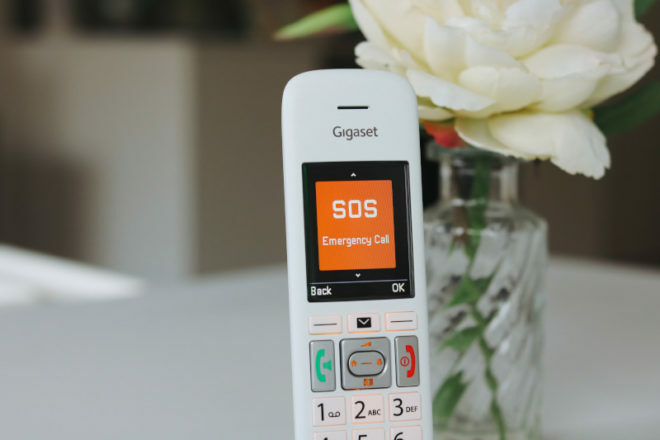 As with all DECT cordless phones, the Gigaset E370A has a potential maximum range of 50m indoors and 300m outdoors. However, the exact range can vary from one model to another. Cheaper models can often struggle to reach even half that range. For that reason, we like to check out every new cordless phone in-house, to see how they really stack up. When we tested out the E370A for ourselves, we found that it performed better than most. It reached the higher end of that max range before it started to drop out. 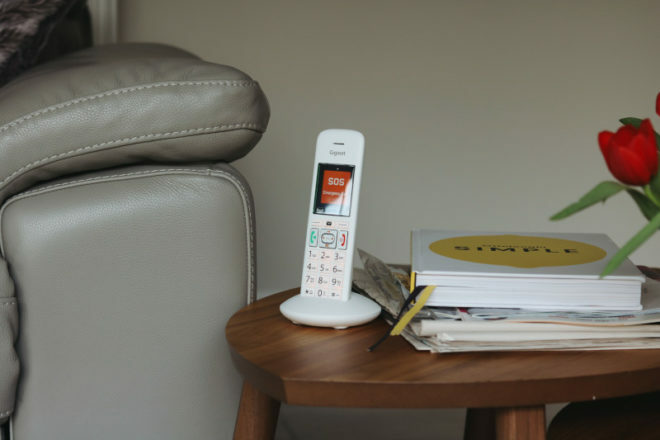 Naturally, the more range you can get, the better- it means you can have multiple handsets dotted around your home, so you're never far from the phone when it rings. For larger homes, or properties with thick walls, not to worry: the E370A is fully repeater-compatible, too! As we mentioned earlier, the base station also acts as a standalone answer machine, with a generous 30 minutes of recording time. You can access messages from either the base or the handset for added convenience. 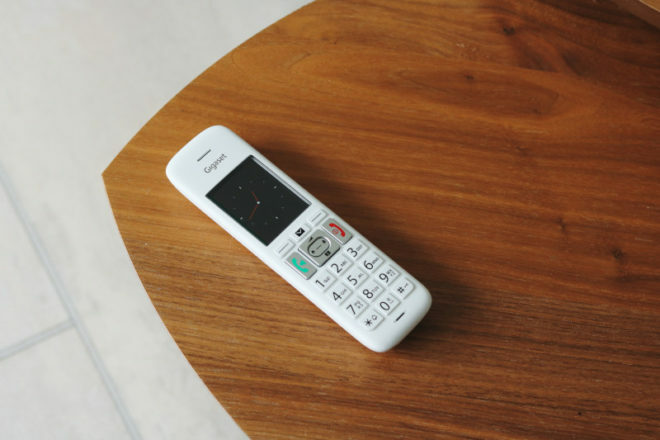 As a big button phone, though, the Gigaset E370A comes with plenty more additional features aimed at older users. We've touched on several of these throughout this review. These include the light up buttons, jumbo font, and extra-loud mode. But there are a few more additional features worth mentioning, too. 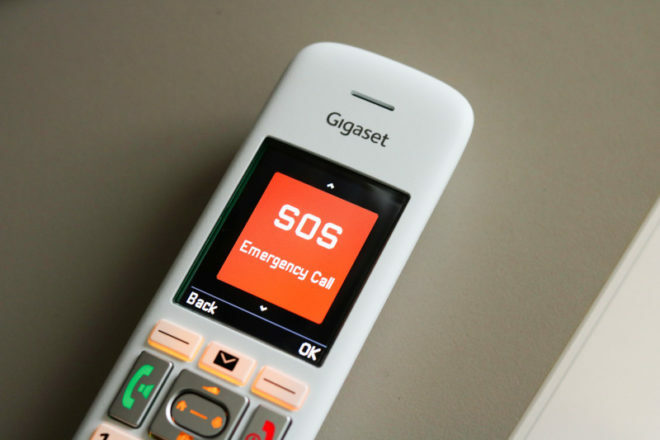 Most significantly, the E370A has a handy SOS emergency call function. This lets you set up to four emergency contacts, who can then be called automatically with just the touch of a button. It's a great little feature that will certainly help put family members' minds to rest! Big button cordless phones don't get much better than this. Not only does the E370A come packed with useful features for older users, but it's also a stylish addition to any home. Convenient without being unsightly, we highly recommend this phone for anyone in need of something a little easier to use, as well as those who find it harder to hear quieter handsets. This entry was posted in Reviews on 18/02/2019 by Daniel.